Life Below The City Of Light: Paris Underground Paris really is a tale of two cities: One of them above ground, with its beloved Eiffel Tower and Notre Dame. And then there's the city very few us will ever see — an underground Paris — the souterrain. 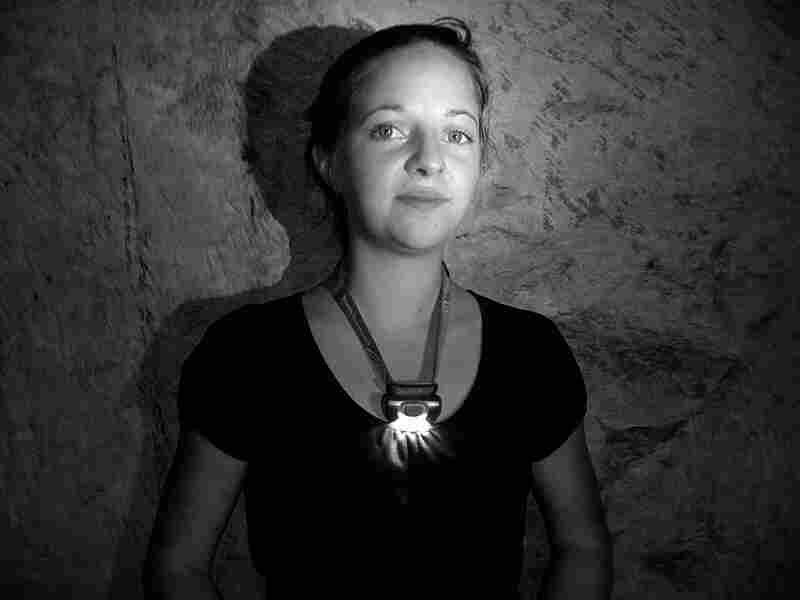 NPR and National Geographic team up to explore what lies below. This story on the Paris catacombs and underground is a collaboration between National Geographic and NPR News. Geographic Photographer Stephen Alvarez invited NPR's Jacki Lyden, contributing host and correspondent, along on a three-week expedition below the City of Light; the story is also the cover feature of National Geographic's February issue. To be a cataphile, it helps to have feline nerves. Last spring, totally in the dark, I joined an extraordinary variety of them — or urban spelunkers and explorers who crawl and tunnel below the surface of Paris into the vast network of catacombs and catholes below. 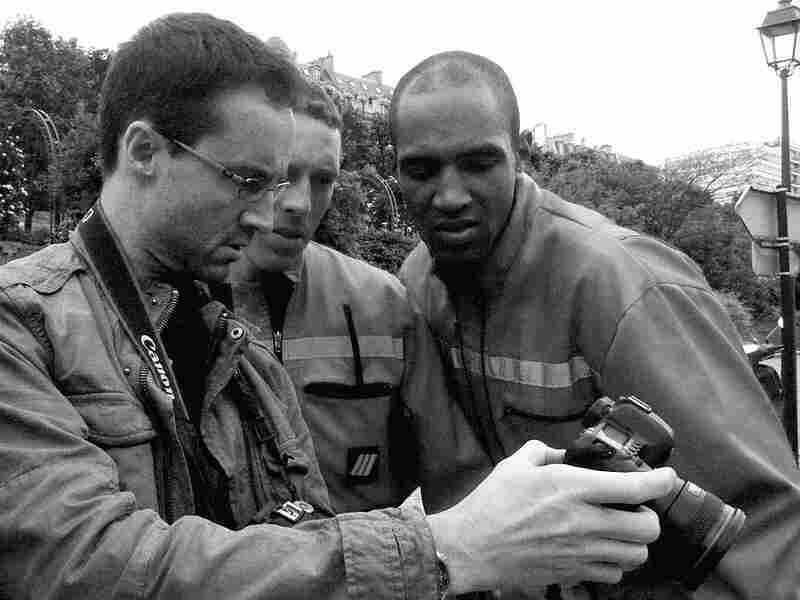 Often beneath a manhole, and by traveling down a ladder, they showed me an amazing world few Parisians have ever seen. My first journey began on a May night in the Montparnasse neighborhood of Paris — in the darkness before midnight. Along with Stephen Alvarez and the National Geographic crew, we slid down a ravine and trudged along an abandoned railroad. We hiked along for a mile in the pitch dark to avoid police attention, because this activity is illegal, but happens anyway. If caught, there can be fines. We squeezed through a human-sized wormhole and suddenly dropped down 60 feet — and back 200 years into the past. The modern world had vanished. We were lonely explorers, traveling single file amid silent bones, rocks and countless antiquities in yawing, pitched quarry tunnels. I could imagine being a miner. 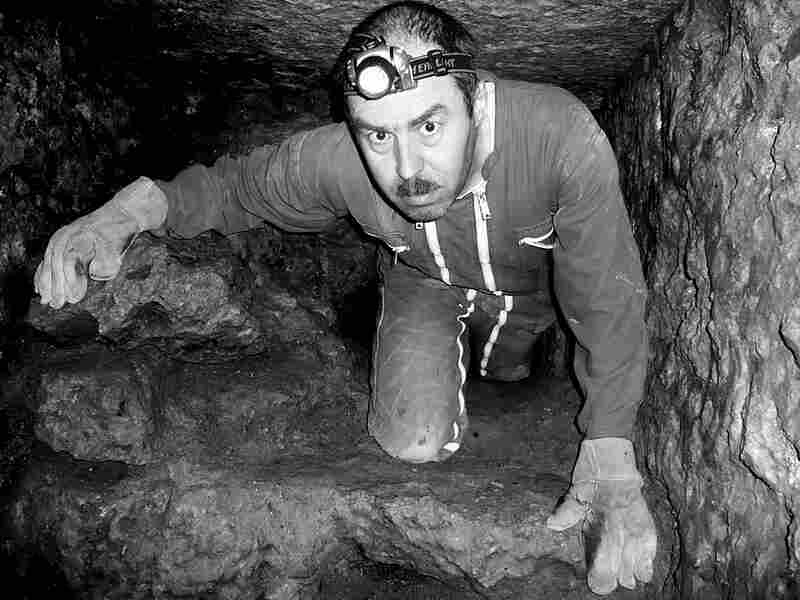 Meet the cataphiles: Daniel Garnier-Moiroux crawls through a very tight section of the Paris catacombs. Exploring the Parisian underground is, of course, a French history lesson. On stone walls, there is graffiti from the French Revolution. More recently, there are former Nazi bunkers — and a few feet from them, hideouts for the French resistance and giant columns to hold up edifices above, like the military hospital Val de Grace. "I've spent literally thousands of hours below ground," said Alvarez, who had brought along his cameras and paraphernalia. 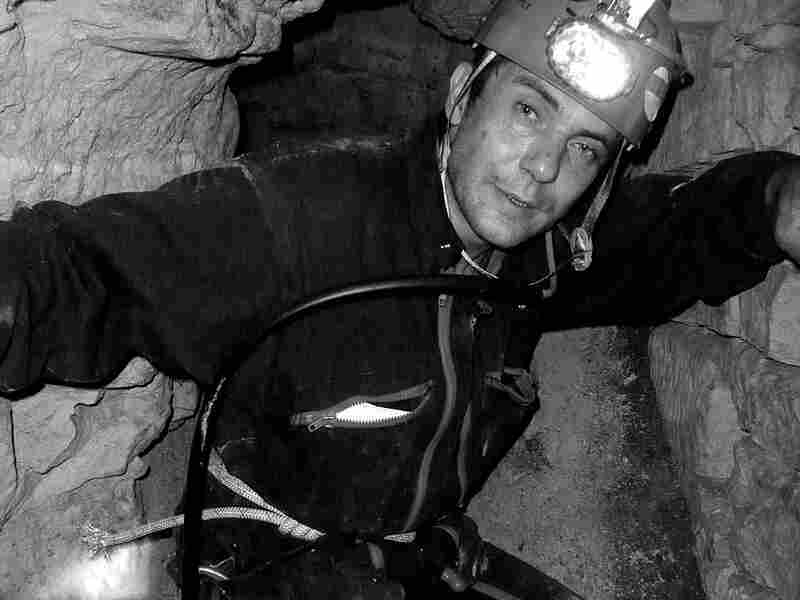 He's a lifelong caver and famous for it. "Down here, I go in and I'm lost immediately. Without someone to show me around, I'd wander around till I died." An exaggeration for sure, but strangely appropriate in the catacombs. As we crawled, walked and loped, Daniel talked about possible dangers, the most serious of them being a sudden fontis, or collapse. That's exactly what happened in 1774 — when a street called Rue d'Enfer collapsed. (Interestingly, the name of the street meant "Hell Street" and has been rechristened Denfert-Rochereau.) King Louis XVI, who would later lose his head in the French Revolution, ordered his architect to the underground to assess the damage. Horrified, Charles Axel Guillaumot reported back that much of Paris could collapse; it was built over fragile quarries that stretched for miles. 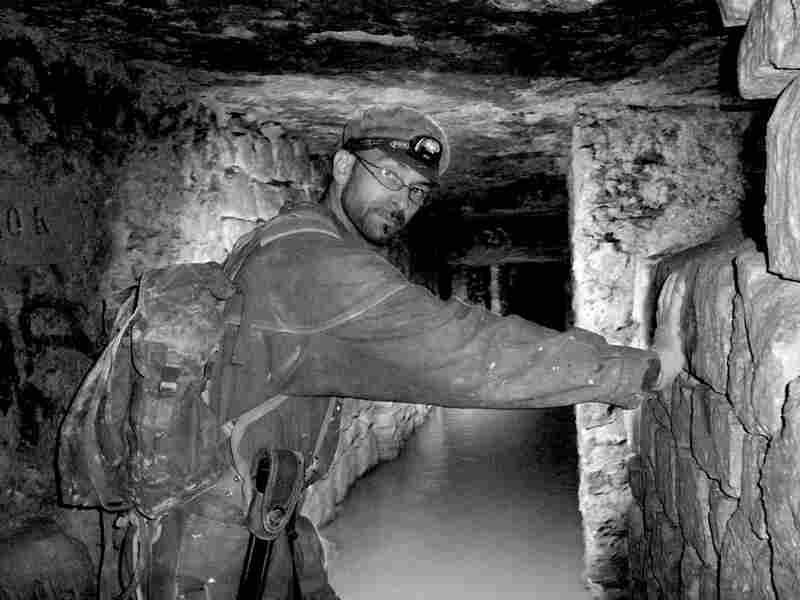 "They created the Inspection Generale des Carrieres [or quarries]," Daniel explained, an agency that exists to this day. "For over a hundred years, begun by Guillaumot, they lifted the quarry tunnel roofs, made right angles, consolidated walls." He showed us how the inspectors matched streets above to "intersections" below, and how they numbered the walls: G for Guillaumot, 1779, say, for the year, and 4 for the number of walls created in sequence that year. Each inscription is etched in carbon black, and some are old French. On one inscription on Rue Vaugirard I saw the words "au couchant, " indicating the western side of the street where the sun would "go to bed." Suddenly, there was singing and shouting and laughing in the distance: We had stepped into the world of cataphile art. A burly man was touching up a mural of a long wave that ran along three sides of an underground chamber. It was a reproduction of the Japanese mural by the artist Hokusai, the joke being that this part of the catacombs is called "La Plage," or the beach, because it's sandy. The muralist introduced himself to me as "Psyckose," as many cataphiles use a "nom de cave" to escape detection above ground by police. "The catacombs is the cross [roads] of the world," he told me. "Everybody is coming here ... from LA, from London, from South Africa. And everybody is totally naked — because there is just dark, and nothing but dead space." That's naked in a metaphorical sense, I gathered, and hardly dead! One of the finest sounds below ground was the festive pop of bubbly. And one of the dreamiest sights: Daniel's friend, Louis, lighting up the "dead space" with a breathtaking fire dance. We watched firelight flicker up and down the walls as Alvarez snapped away. As I poured the water out of my Wellingtons, we toasted the catacombs. And as we hiked out just before dawn, the birds were already singing, and the city was quiet and lovely. But over the next weeks — and again in December — I would return below for one adventure after another, for the cataphile universe is as distinct as each and every person who inhabits it. And perhaps, I've become a bit of a cataphile myself, but only on the radio can I be your guide. Learn more in National Geographic's February issue.